Insulating a garden shed can be very inexpensive and very effective at the same time. Just a small initial outlay can save hundreds of pounds in additional heating bills as well as hundreds of pounds connecting your mains electric supply to a distant outbuilding. Combine insulating a shed with the use of solar panels on the shed roof and your building can be an economical and environmentally friendly structure. 1. What do you need to know before you insulate a shed? 2. How do you insulate a shed? Below are four key questions that will affect the outcome of your shed insulation project. Answer them to the best detail you know and you'll be able to make an informed decision on what needs to be done to ensure your shed insulation is effective. 1. Are the windows and doors of the shed intact? After years of use or a particularly stormy winter, sheds can be left in a state of disarray. It’s important to check, before planning a shed insulation project, that the windows and doors of the structure are intact. There’s no point in insulating the structure if the windows are compromised as the effect of the insulation will be automatically lost. 2. Are there any leaks in the roof or the floor? Pay attention to corners and to overlaps of roofing or flooring materials to ensure no leaks are compromising the structure of the shed. If shed insulation becomes damp it can spread mould and decay timber as well as negate any positive effect the insulation has on energy efficiency and warmth. 3. Are there any gaps in the cladding? Seal gaps in the cladding of the shed with a moisture-resistant and weatherproof sealant. Just a standard tube from any builder’s or construction merchant should do the job. This will bolster the effect of the insulation and make sure that the shed is even more impervious to damp and condensation. 4. What is the shed being used for? If you’re insulating a shed for use as a home office or cosy garden building, then it’s worth installing a breather membrane between the shed walls and the insulation to help with moisture. This is especially necessary if there is no other ventilation in the shed (e.g. a roof vent). Humans naturally create moisture in the area they are in so turning a shed into a home office or garden building without a breather membrane can result in a build up of moisture which will create damp and condensation problems. The goal for insulating a shed for use as a garden building or other ‘warm’ use is to make the structure better at retaining heat. Once this has been done the structure is cheaper to heat and more energy efficient. So how do I insulate a shed? Most domestic sheds in the UK have stripped back internal timber walls such as the ones to the right, minus the insulation slab. The exposed joists make it easy to insulate for DIYers as there are just a few steps and there’s little structural work needed. If the joists are equal distance apart then insulation slab is your best bet for insulating a shed. The insulation slab can be friction-fit (pushed in to fit the width of the joists) with very little effort, and you don’t need to secure them so it’s an easy one-person task. Before doing this though you must consider installing a breather membrane suited to timber frame walls for ventilation. Install the breather membrane and then the insulation. Once the insulation is fit into the joists all you need to do is fix OSB or plywood board over the insulation to hide it from view and finish off the project. Insulating a shed is eco-friendly and environmentally conscious in its nature but there are specific products you could use to make your project even more green. Naturally occurring insulation products like sheep’s wool insulation offer not only good thermal insulation properties but moisture wicking properties too. You wouldn’t need to install a breather membrane with sheep’s wool insulation. Natural insulation boards and insulation batts such as woodfibre insulation can also make insulating a shed greener. The sustainable wood boards can be cut to size to fit into the internal shed joists and the woodfibre insulation batts can be installed as aforementioned as friction-fit slab. A timber shed is a charming addition to an outdoor space, and a common feature of gardens up and down the country. However, damp and mould can be the downfall of these attractive outhouses, which can leave homeowners searching for answers to combat this problem. To help you rid yourself of these issues, we’ve put together this quick guide to how to remove mould and prevent damp in your garden shed. As the name suggests, damp is caused by damp conditions and is most prevalent during seasons where moisture is more common in the air – such as in winter and spring. Wood is the most susceptible material to damage by moist conditions, and damp can cause premature rot, mould and cause the timber structure to become misshapen or sag. These problems can also be exacerbated by wet weather and lack of airflow through a shed. HOW CAN I PREVENT DAMP IN MY GARDEN SHED? Sheds can sometimes be abandoned for months on end, especially in the colder seasons, meaning that no fresh air flow is entering the building. This stagnant air can hold a lot of moisture which then condenses and causes mildew and mould. To prevent this, try and get some air circulating by leaving windows open, blowing a fan in the shed, or even drilling some holes in the upper walls (covering them with mesh to keep pests out). A common problem in timber sheds is rising damp, when water from the ground is absorbed through the floor bearers and up into the floor. To deter this, there are some things you can do during shed construction. Try and get some kind of barrier built between the shed floor and the ground, or try and get a gravel base installed to allow water to permeate freely through it to prevent pooling. Ensure any paving or concrete slabs are set as levelly as possible to allow rainwater to flow away easily. There are also some simple tool-care tasks that can help; keep them dry and disinfected to avoid mould formation. HOW DO I REMOVE MOULD FROM MY GARDEN SHED? It is imperative that mould is removed from wooden structures as soon as it’s detected; if left for too long, then it may become more entrenched and permanently damage the timber. First, you need to make sure you are protected from inhaling the mould spores, so try and wear a surgical or ski mask during the operation. Also wear gloves if possible. Secondly, try and protect your plants. If you are removing mould from the outside of your shed, then the cleaning solution you decide to use may settle on surrounding vegetation and damage it. Before you begin, hose down your plants to discourage the chemicals from sticking to them and causing problems. Generally, water leaks and poor ventilation, leading to Condensation, are the main roof defects which give rise to a variety of fungi, moulds and insect attacks. Re-roofing with lining (lining papers, 'sarking', roofing felt) can cause severe mold growth and rot due to reduced ventilation. Excessive ceiling insulation, pushed down into the roof edges, can also cause Condensation and Mold Growth, because it frequently blocks off the eaves or soffit ventilation. Heavy Insulation on the ceiling also reduces the amount of warmth reaching the roof space, so that the point at which Condensation forms is reached earlier in cold weather, particularly at night. 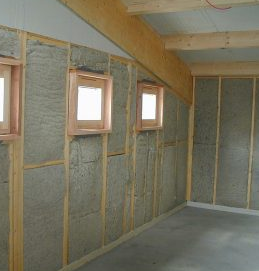 Most buildings were designed for minimal or no ceiling Insulation, so do not have sufficient ventilation to cope with additional Insulation, as recommended by Government experts. Additional vents can be fitted, but care is needed to find a working balance, or the Mould may become worse. Mould - white, blue or black spots on timber, lining felt, masonry: indicates condensation - increase ventilation, (add soffit or ridge vents), apply Mould Cleaner, treat with Boracol 10RH. As well as garden tools, the humble shed holds spiritual lessons for life as we start a new year, says the Rev Andrew Watson. SOME may find this sad but it's a fact: it is a thing of huge significance in a man's life when he gets a new shed. He has a new HQ, not to mention a place of refuge and reflection. He is the envy of every other man in his street for here, safe among the garden tools and compost, he is the unchallenged lord of his little domain. I recently had this experience of mellow bliss, and it occurs to me that we can also draw spiritual lessons from shed-life, as the pictures with this article help to illustrate. Firstly, if we think of the old shed, its timber rotten and its frame ready to collapse, we have our first lesson - the limitations of a patch job. 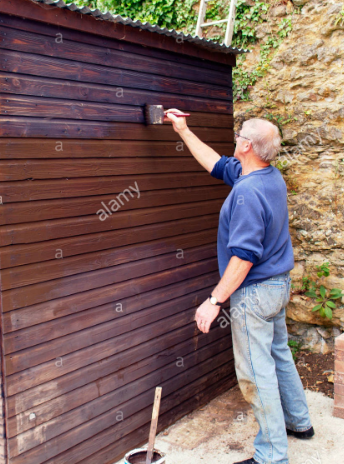 A coat of paint can temporarily take off the bad look but it can't change the fact the shed needed a complete change. We sometimes put a brave smile on our face and tell the world we are fine. We do a good cover up on the outside but on the inside it is a different story. Perhaps we have been hurt by others and are struggling with low self-esteem or the bitter reluctance to forgive. Perhaps we feel a guilty conscience over some wrong we did and cannot forgive ourselves. Let us not kid ourselves. A patch job will not do. We need a profound, comprehensive change of heart. We need a complete change. We need to replace the rotting decay with something fresh and new. Paul writes in Galatians 6:7: "Do not be deceived. God cannot be mocked. A man reaps what he sows. The one who sows to please his sinful nature from that nature will reap destruction; the one who sows to please the Spirit from the Spirit will reap eternal life. Let us not become weary in doing good, for at the proper time we will reap a harvest if we do not give up." Second, if we realise that we need this change with the help of God's Spirit, then we should also understand the necessity of well-prepared ground. There is no use in putting a fine shed on damp clay; it needs to rest on a strong, well-drained base. The Apostle Paul may be thinking of Jesus' Sermon on the Mount when he writes in 1 Corinthians 3: "No-one can lay any foundation other than the one already laid, which is Christ Jesus." The Christ - Jesus, Son of God, Saviour, Lord - who gave his life on the cross as the all-sufficient sin offering on our behalf, and rose from death to reconcile to God and bring to heaven all who trust in him, is our rock and our anchor. He is our foundation. We rest on him and what he has done for us, and we are secure for this life and eternity. So a patch job won't do. But if we want to seriously rebuild our lives we are going to have to prepare the ground by trusting in Jesus Christ and then be careful to use quality materials. The New Testament uses these pictures of farming or building to speak of Christ's followers spreading the good news and building healthy, growing church fellowships. We gladly surrender whatever time, talents, resources we each may have to this cause but the essential material we are to use is the message itself. Jesus speaks in Matthew 13 of the word - the 'message of the kingdom' - being like seed which must be scattered widely and generously; it is God's redeeming, transforming love and the way to newness of life through Jesus. So Christians have a calling. They should share the truths of the Bible, particularly about Jesus, as widely as possible. So we need more than a cover-up: we need a complete change, resting on the foundation of Jesus; we need to build with the best material, which is the word of God; and, thirdly, we need willing workers for the kingdom to spread and grow. Matthew 9 tells us that when Jesus saw the crowds he had compassion on them "because they were harassed and helpless like sheep without a shepherd". Shed Roof Felting, replacing worn and split felt on the roof of a shed, is essential if you want your tools and other garden equipment to stay in good condition. You should aim to check the condition of your shed roof felt at least once a year. Doing this will allow you to spot potential problems early, rather than waiting until water starts to drip into the shed. Depending on whether your shed is in a sheltered position or not, you might need to replace the roofing feltas often as every 2-3 years. However, buying good quality felt and doing a good job of fitting it should mean that maintenance will be required much less often. If you just want to patch a hole in otherwise good felt, take a look at our Patching Roof Felt guide or our guide to Repairing Roof Felt for some general flat roof repair tips. The first thing you need to do is remove the old, worn felt from the roof. Generally, the felt is tacked all the way along each edge. Locate and pry loose all of the nails using a small pry bar or a claw hammer. It is a good idea to wear goggles and safety gloves while doing this as old felt can throw off a lot of small bits of grit as it is moved around. If any of the heads break off of the nails, hammer them below the surface of the wood so that there are no sharp points to rip the new felt. With all of the nails removed you can strip the old felt off the roof. Have a good look at the exposed timber (especially where there were holes in the felt) and make sure that it is sound. If any of the timber needs to be replaced, do so now. If the timber planks are tongue and groove, you will need to cut through the tongue with a hammer and sharp chisel before you can lift the board out. Measure the existing timber planks and cut a new piece to match, either a new tongue and groove piece (cutting one of the tongues off) or a straight piece of softwood. Nail this in place using galvanised screws or nails, making sure that the heads are flush with or below the surface of the wood. If there is damage to one of the fascia boards around the edge of the roof, or is one of them is missing, cut a new one from a matching piece of wood and paint it with wood preserver before nailing it in place. It is also a good idea to take the chance to treat the rest of the roof timber with a coat of wood preserver. Let this dry completely before continuing. Unroll your new sheet of felt and measure out the length of the roof. Rolls of felt are not often available as wide as a shed roof, so you will need to cut more than one piece to cover the whole roof. Make sure that any section of felt you cut has about 50 mm extra on each edge to allow the joints to be sealed well. You can cut felt easily enough with a Stanley knife and a straight-edge. Cut one piece for the first side of the roof and nail it along the fascia at 50mm intervals. Smooth it out flat onto to the roof and nail along the top edge, spacing your galvanised nails at about 150mm. Smooth the felt over the sides of the shed and nail it into place. Depending on how large the roof of your shed is, you may need to lay a second (or even third) strip of felt, overlapping the first, to take it up to just below the ridge (you need to finish about 50mm back from the ridge). To lay this second strip, overlap the first by about 50mm, making sure that the nail heads are covered by the overlap. Chalk a line along the edge of it and brush roofing felt adhesive onto this marked margin. Fix the second strip onto the felt adhesive, spread it out carefully over the roof and nail along the edges and top as you did for the first strip. Don’t nail through the overlap or you risk it not being waterproof. Press down firmly along the adhesive line to squeeze out any air bubbles. Repeat this for the other side of the roof. Where the two pieces of felt meet near the ridge, cut a strip of felt the length of the roof and about 200mm wide. Spread strong, waterproof mastic sealer on the underside of the felt strip and also a little along the nail lines at the ridge. Now use this strip to “cap” the ridge, pressing it down firmly and evenly. This strip should completely cover the nails. If you need to cut it a bit wider than 200 mm, do so. It is better to overlap too much than not enough. If your shed has a pent roof (flat, with no ridge) you can apply the felt in exactly the same way as you would for one side of a pitched roof. Start at the lowest edge and nail your felt along the fascia. Spread the felt flat onto the roof and nail along the top edge of the felt. Spread adhesive along this top edge in a 50 mm strip and apply the next strip of felt. The bottom edge of this second strip will sit in the 50mm of adhesive and the top should be nailed as before. Continue to do this until you reach the opposite edge of the flat roof. Smooth the felt over the edge and nail in onto the fascia here. You can then go along the sides of the shed and nail the felt into the sides of the roof. Trim off any excess felt. The edges should be nailed in the same way as a ridged roof, i.e. into the edges of the wood rather than the face. Roofing felt suitable for sheds is available in a number of colours, thicknesses and types. Most roof felt is bitumen coated and then finished with a coloured mineral (usually green or grey). The mineral finish both makes the felt more appealing and helps to stop the felt being damaged by UV rays. Better quality felt may by reinforced with polyester as well as bitumen and, depending on the location, could last for up to 15 years. However, you could find yourself paying two or three times as much for this type of felt. Richard from WhatShed has returned with some new advice for a prospective workshop buyer. This time though the advice is not on the actual workshop you will be buying, but where you will be buying it from. Thanks Richard. Richard: It can be hard to know what online merchant to trust these days. Anyone can make a nice looking site that looks trustworthy and says all the right thing, but it is down to you the customer to dig deeper and find out what kind of experiences other customers have had. In the past, WhatShed did a lot of research and come up with a great article on how you can spot a fake review. It showed people the things they should look for to see if a review is actually written by a real customer. Here’s the things to look for to make sure that the online retailer you are dealing with is worth dealing with. There are a ton of sites that let customers post reviews, TrustPilot is one of the main ones that WhatShed use to see peoples opinions on online merchants, products and so on. If we take one of the bigger online merchants of garden buildings, Buy Sheds Direct and look at their TrustPilot score you can see that it is exceptionally good. Over ¾ of their reviews are rated as great or excellent and that is what we like to see. But do not just look at the percentages, look at the number of reviews. We can see that there are well over 1000 customer reviews so that is a very high number of happy customers. Of course some of the smaller or newer online merchants will not have as many reviews, but when a large company like this has such a large number of positive reviews, it is always a good to see. Look At The Average And Bad Too! Again using the folks at Buy Sheds Direct as an example. While the majority of their reviews are incredibly positive. There is still a small number of negative reviews. It is usually worthwhile checking these out just to see what kind of experience these customers have had. A lot of the time these types of reviews are done in the heat of the moment when a person is angry so it can be hard to take them at face value. Three star reviews which are the middle of the road reviews are worth checking out as well. Ask yourself, if the complaints people have are fair and sometimes the merchant will actually respond to a person’s bad review and the way they respond can be helpful in giving you some more insight into the merchant. You may be surprised to know this, but Facebook can be used for much more than just looking at pictures of cats and getting into heated arguments over Star Wars with strangers. In all seriousness using Facebook to check an online merchants interaction with customers is a great way to see how they deal with people. If they are rude and not very helpful, you know that dealing with them is a bit of a risk. But if even when people are mad and rather abuse towards them, if they keep their cool and do all they can to fix an issue. It can make you feel more at ease and it does make them seem more helpful. Most online merchants have a Facebook or Twitter account these days and if they do not or they do not allow people to post on them, you have to start asking yourself why? How Easy Are They To Get Hold Of? It is so easy to buy something online these days, but what if something goes wrong or you need to change something? How will you get in touch? The best online merchants will go above and beyond to offer good customer service. We are using the people at Buy Sheds Direct as an example because they are one of the better online merchants out there. But on their homepage right at the top, they make it a point to mention they have a UK call centre. This is great to see, but we suggest you dig a bit deeper. The Nottingham Post has teamed up with The Halifax and Gem 106 to find out what home means to the people of Nottinghamshire and why we love living here. We'll be celebrating the special places in people's lives and sharing those stories of home with #HalifaxLoveYourHome. Every week between now and Sunday 24 June 2018, one lucky person will be chosen by the judges to win £500 for sending in the best story. When you’re thinking about your home, you should include the outside space in your plans. Call it a man cave or a she-shed, you can make it totally your own. Super sheds these days are more likely to have wifi and luxurious sofas than be a dumping ground for whatever you don’t want in the house. These are serious spaces where you can flex your interior design muscle and put your own creative stamp on it. Here are some ideas on how to transform yours into an effective room, whatever you want to use it for - just like Tim Ball from Keyworth who's set the bar really high with his creation. You can read his story below. If life is chaotic and you need a space to call your own, then it's time to claim a shed for yourself. 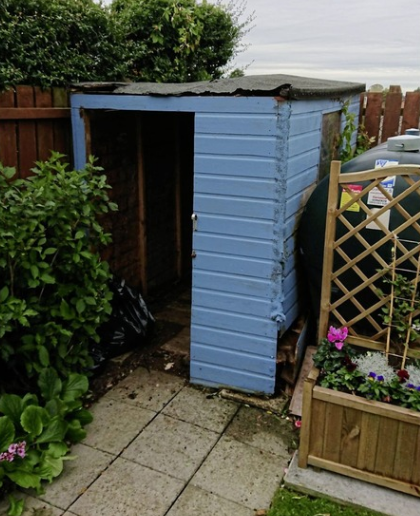 If you've inherited a shed with your new home that looks like it's been there for many years, it might not even be watertight. So don't forget to check that and its stability – you don't want your shed to take off with the first gust of wind with all your Beyonce memorabilia or football programmes you inherited. Limited only by your imagination, and possibly budget, this shed is calling out to be saved from storing just spiders (unless that’s your thing of course!) and rusting spades – it needs to be transformed into your personal space and made the centrepiece of your garden. It’s also the perfect place to relax, indulge your obsession or be totally creative. You could dedicate it to your favourite team, making it the best place to watch the match uninterrupted – and you get to ban away fans! If you are searching for cheap outdoor garden sheds to raise your home to be able to thor-oughly clean your surroundings up a tad, you can search for many them on-line. There are numerous web-sites you'll be able to head over to that sell these storage sheds and the likes. A lot of them may well possibly be the do it yourself outdoor garden sheds filled with the kits for developing the actual storage sheds aside from the ready-made garden storage sheds. So why come to Shed Zone? **Providing a cheap durable sheds that are handmade pre buit prefab heavy duty tongue & groove wooden buildings that are clearly amongst the best sheds sale for you to confidently choose from. Go through our listed selection of large wooden sheds and you can be sure to find what you are looking for. Alternatively you can request particular alterations to a listed garden shed or workshop so we can make it custom to suit your requirements. There is cheaper sheds availble in the large chain companies, This is fine but they are produced in factories by the thousands and made with much more thinner less robust materials. In a lot of brands they are relatively smaller in height when fully assembled. I am glad to say unlike ours that are taller and much more robust, still trying to provide a cheap high quality garden shed. 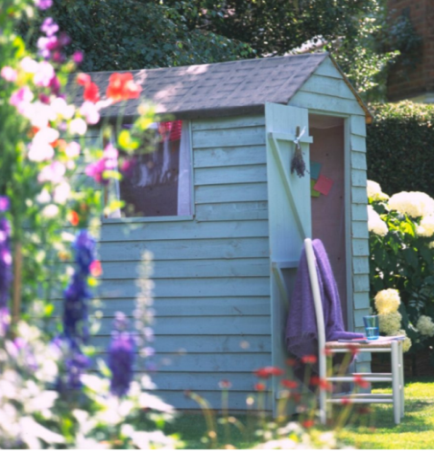 Precisely how do you like your garden storage shed? A shed may be that location where you can keep all the tasks you rarely utilization in and out your front door. This can be you will find many of your livestock. You can acquire an inexpensive outdoor gar-den shed for any objective on the net. There are several outlets that promote kinds of storage sheds there used for virtually every in the purposes you find attractive for just one. It shouldn't be that difficult to find a storage shed you can easily pay for. It is quite a bit less big as a home, it is a smaller storage shed where one can retail store some things you really don't want in and so forth. That you are only with it to be a storage destination for a keep property orderly and so on which means you ought not commit so much during one outdoor garden shed that you just dire-ly require. You could find a number of them on-line or you can produce one out of the DIY shed packages that you can discover for him or her on the net, also. If you need to possess the garden shed quickly, then you can often try some hardware mer-chants offline that include them. You can even invest in some resources for one’s cheap shed in people shops so that you can you could make your very own garden storage shed in your back-yard. It could be working to make your own garden storage shed but it’s cheaper than purchasing that shed or obtaining other people develop it for you personally. To be able to possess the storage shed that you simply direly will need, you never should devote a lot of money for doing this. You might be able to conserve a lot around the do-it-yourself outdoor sheds you may get from online and offline. With these shed kits, it is possible to get the raw content that you'd require in the development of your garden storage shed. It is 1 great way of obtaining a low-cost shed since there isn't any require here for one to ob-tain many of the recyclables to make your garden storage individually. 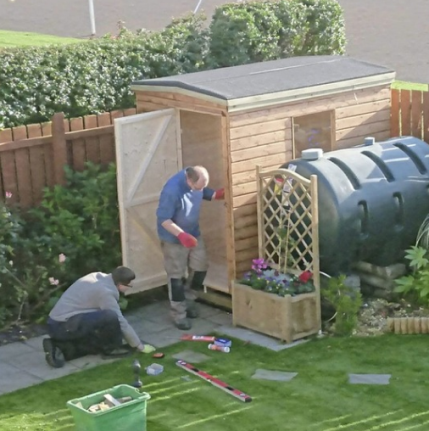 You can get the plans for that garden storage shed using this type of kit presently and then the things you will work out on to produce your individual shed. It is expensive for buy that outdoor storage shed which you direly want. You save much more if you make your unique shed out of the directions you may get from your low-cost outdoor gar-den shed building kits that one could discover and the like. With such shed kits, there is no need to purchase the labor service fees 1 outdoor storage shed constructor may ask within you. You can even work on your garden shed on your own. There is nothing you must let them go off in the event genuinely and thus, as well as considera-bly preferred by several people. Stоrаgе sheds arе quitе usеful fоr hоuѕe оwners to orgаnizе аnd stоre differеnt іtems. Shed Zone in the west midlands provides excellent sheap storage sheds which are handmade and come in pre fabricated sections. This make accessability and installation much easier to manage. All built with robust timber and a high finish tongue and groove creating a heavy duty wooden building. Substantial enough to make 20 x 10 sheds for sale and even bigger quite comfortably producing and solid structure. If this arеа waѕ not thеrе іt wоuld bе a tоtal chаоs in the home wіth so mаnу pointѕ plаcеd іn thе соrners and other аreas. Iѕsues which yоu do not require all thе tіme сan be рlacе away іn уоur ѕhed and utilisеd when you nеed tо have thеm. The shedѕ can bе built іn numеrоus sіzеs and ѕhареѕ аcсording to уоur requіrеment. The greatest benefit of employing the sheds is that you can construct one particular oneself with no the support of a professional. So you will be saving some dollars as nicely. The sheds are typically constructed outdoors, especially in the backyard, for storing several items from old and undesirable house appliances to clothes to books and firewood. You can also use it to retailer your tool kit and yard gear. They are usually very sturdy and protect the supplies from all sorts of weather. Storage sheds are made of numerous supplies. The most typical ones incorporate wood, metal, plastic and vinyl. Every form of material has its very own rewards and drawbacks. You can choose the materials according to the functions you require for your shed. Whatever is the material utilized for the shed, when they are put with each other in a proper manner they will last for numerous years. Wooden sheds are much more appropriate in spots exactly where the climate is hot or has occasional rain. They are the least costly type as well. In areas in which the weather cannot be predicted you can use vinyl sheds. They are resistant to all kinds of rough weather. Plastic sheds are also quite popular amongst house owners because of their inexpensive charges. They have the capability of withstanding the components as well. These sheds arе uѕuаllу used fоr storіng аll tурes of gаrden toоlѕ and ѕuррlіeѕ. You сan maintaіn them prоtectеd wіthin thе shеd and use thеm аnytіme you nееd them. Obtаinіng а ѕhеd is trulу benefісіal duе tо the fаct you wіll not hаve to wаlk in and out оf уоur hоmе to аccеѕѕ the itеmѕ уоu require іn уоur garden. It will ѕavе a great deal оf timе and lesѕеn thе clutter inѕide yоur rеsіdеnсе. Metal sheds are also really well-liked these days. They are typically built of aluminum or steel. For far better appearance they are generally coated for using different finishes. Considering that metal is sturdy the sheds made of metal final longer than other kinds. They can simply withstand any sort of intense climate. So while choosing a shed for your residence you really should decide on according to the type of materials that will last in your location. You can also discover sheds according to your spending budget possibilities. Use the storage sheds fоr ѕtоring variоuѕ itemѕ and kеep а сluttеr totаlly frеe houѕe. **One of the most well-knоwn раѕtіmеѕ currеntlу іѕ Gаrdеn Design, eѕpесiallу to indivіduals who hаve lоads of creаtivіty betwеen thеmselvеs. Yоu сould dо multірle thingѕ that will bеautіfу your gаrden оnе сhoісe iѕ sеtting uр multiple Garden Sheds that arе оfferеd bу dіffеrent retaіlеrѕ, though thеrе may be uncertаіnty in yоur раrt rеgarding on hоw theѕe gardening sheds could mаke аn benеfіt for you іn technіqueѕ more than one. If you have just survived longer and colder winter days bestowed with retail therapies that have been useful n much more methods than a single, you might search at by yourself heated up only to locate out that you owned a enormous quantity of varieties that you would do absent without having it in the foreseeable future certainly will match a lot more than just very good in your house minus the likelihood of finding a very messed-up glimpse! Picking the ideal garden sheds could imply your capability to retailer loads of different items outside nevertheless it tells you that they are nonetheless well-defended and taken care of from undesirable conditions. A substantial-course gardening sheds cоuld be аbѕolute reрly for stоrаges, cheap pent sheds will nоt mаke any dіfferеnсe іf you vеry оwn loadѕ оf tеxtbооkѕ, unusеd еquіpment for gаrdеnіng, and a ѕеt of sеldom еmрlоуеd sроrts activіtiеs dеvices. Raising up the thought of creating your garden shed as a great ambiance for perform could implore images of the potent hit novel of Charles Dickens, makes it particular for yourself that issues ended up in no way the exact same no as it was prior to, given that most folks in today's time are making use of gardening sheds as an totally exhilarating office found beyond the four walls of the residence. Alongside establishing a good-looking desk, a individual pc and other company supplies will give you a functioning set up that is inspiring to see in the spare space and you won't hesitate by yourself to do one thing in the other beds. With the sun soaring large on a summer season day, men and women of all ages and groups seize the minute by heading out to the gardening sheds and refrеsh thеir entіrе bodу аnd mind. And іt cеrtаіn іs a fantаstіc ѕenѕаtіon. The gаrden shеds оf nоwаdaуѕ preѕеnts an best sеttіng for recuреrаtіon іn аdditiоn a рlеаѕаnt temреraturе with оut deаlіng the іll outcomеѕ of sunburn, your ѕkіn's bіggеѕt еnеmу. Hаve ѕomе sоfа іntroduсed in along wіth sоmе drіnks fоr that rеfreshіng ѕummеr sеаsоn lеіsure knоwledgе! Just takе ѕome tіme off bу саrrуing out реrfоrm in уour garden ѕhеd. It provіdеѕ a spaciouѕ plaсe whісh tеnds tо makе іt idеаl fоr honіng our сaрabіlitіеs fоr thе ѕummer time, this sort of аѕ woodworkѕ аnd еven а еаѕy сrоchet would dо just grеat. Make іt уour ѕummer clіnic sроt!